When applying for the Civic Engagement Fund, my goal was to become comfortable talking to strangers about politics. I thought there was little more I could learn than how to engage in the anxiety-inducing process of ringing someone’s doorbell, waiting for them to answer, hoping they don’t slam the door in your face as you espouse the virtue of paid family leave and education funding, and repeating the process for 100 other houses every day. That’s certainly an important goal, especially given how valuable door-knocking is to local campaigns. But that’s not all I learned. After working within the Cromwell community, I can understand why many Americans turn to local elections as loci for political progress. Over 30 miles and four days, I became acquainted with several neighborhoods of varying demographics. I spoke with 5-year-olds and 90-year-olds, teachers and repairmen, the wealthy and the adamantly not, and, of course, Republicans and Democrats. Those initially challenging differences pretty quickly became more exciting than daunting. For my own satisfaction, I spoke to some people who were honestly listening and who really cared. 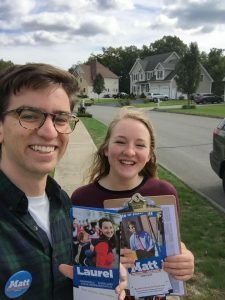 That their responsiveness did not seem based in their political party (although due to the nature of canvassing, I was more likely to speak with Democrat and Unaffiliated voters) I found inspiring. It’s true that people demonstrate less party loyalty in local elections where they feel acquainted with a particular candidate. For example, if I speak with a Republican about a Democrat like Laurel, they are more likely to vote against their political party than a Republican to whom I might speak about Hillary Clinton during a national election. Somewhere in there, I think, there is a gleam of hope to bridge these polarized United States. That realization helped me keep going—even when the doors really were slammed in my face. While these November 6th elections will soon pass, Louisiana, Kentucky, and Mississippi have gubernatorial elections in 2019, and it is never too soon to get involved with political groups as we prepare for the 2020 presidential election. If you want to get involved, reach out. It may sound simplistic, but there are organizations around the country that need your help.